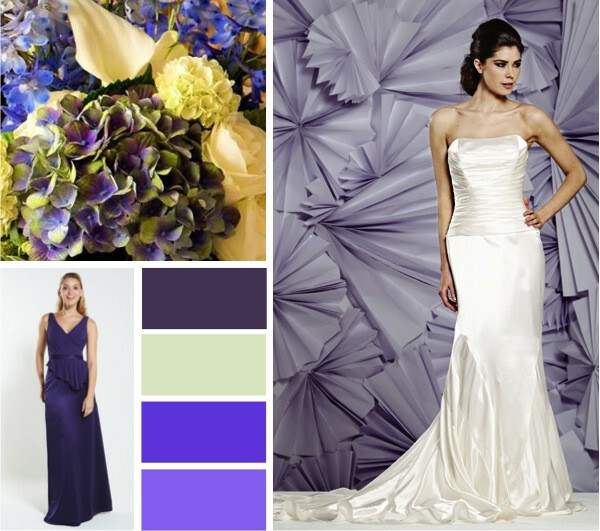 Stuck for colour ideas for your wedding? It can be hard to think up an original colour scheme but fear not here are a few colour combinations to get you started. - Choose 1 colour and a second supporting colour and work from there. - Only use a 3rd & 4th colour as an accent so the main colours are kept predominent. - Carry the ratio of main colours vs accent colours through every aspect of the wedding to create consistency. - Use colours from supporting sides of the colour wheel or for contrast direct opposites. - Use shades and tints of the same colour. - Have fun with choosing colours and let them reflect you and your partner. All the greens apple, sage, leaf & emerald wedding colour palette with a chiffon leaf colour bridesmaid gown. Pistachio, Peach, Coral & Candy pink bridal colour palette with a satin & lace Pistachio colour bridesmaid gown. 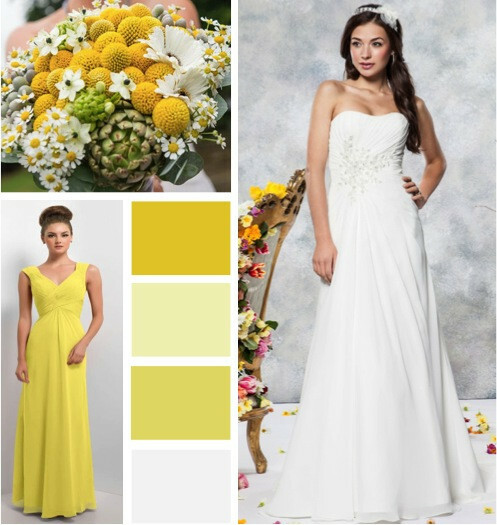 Daisy, sunshine, buttercup & latte bridal colour palette with a chiffon sunshine colour bridesmaid gown. Beige, cocoa, gold & ivory bridal colour palette with a chiffon cocoa colour bridesmaid dress. Warm autumn wedding palette with gold, taupe, champagne & burnt orange, with a chiffon bridesmaid dress in colour gold. Sienna, cerise, ivory & ruby bridal colour palette with an iridescent chiffon cerise bridesmaid dress. Amethyst, bluebell with plum with an accent of sage. Amethyst colour chiffon & satin bridesmaid dress. A muted colour palette of misty blue, periwinkle and iceblue with an accent of dusty rose. Misty blue colour chiffon bridesmaid dress. Rose, chanel & petal pink with shadow grey. A grey chiffon bridesmaid dress with a chanel pink band. Watermelon & lipstick pink with ivory, peach make up this summer wedding palette. Chiffon bridesmaid dress in watermelon colour option. Pretty pastels wedding palette with blush & mellow peachy colours, Chiffon bridesmaid dress in colour petal.